The President, Shri Pranab Mukherjee presenting the Nari Shakti Award to Smt.P. Kousalya (Tamil Nadu), at the presentation of Stree Shakti Puraskar 2014 on the occasion of International Womens Day, at Rashtrapati Bhavan, in New Delhi on March 08, 2015. 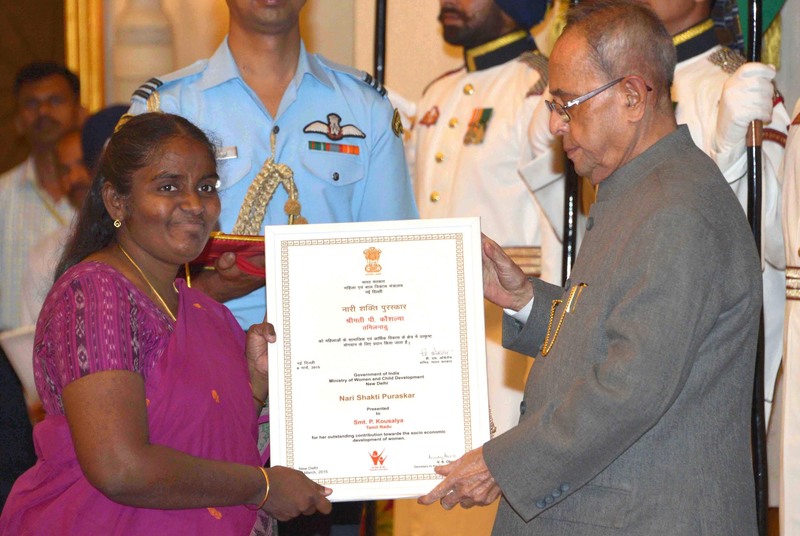 Dr. Avnish Jolly, Toronto, Canada, Wednesday, March 11, 2015 : Kousalya Periyasamy has been honored with ‘Nari Shakthi Puraskar’, by the Honorable President of India Shri Pranab Mukherjee on March 8, 2015 on the occasion of International Women’s Day, at Rashtrapathi Bhavan- it is constituted by Women and Child Department recognizing the contribution of women or organisations which are working for upholding the rights and issues affecting women in the country. Kousalya who has dedicated her heart and undying spirit for issues of Women and children living with HIV rightly deserves the award and the HIV community all of us who are living with HIV, key population, Activists, advocates, program implementer, managers, govt officials – yes all of us can feel proud of her. The term “death sentence” was often associated with a positive HIV diagnosis. HIV/AIDS is considered as a stigma in the society but not many know that people of all sections are suffering from this deadly disease. In the early 1980s medical fraternity began noticing rare cancers and infections striking otherwise healthy young gay men. Something was destroying their immune systems — something fatal and possibly contagious. At first it was called the ‘gay plague.’ Then others began dying: Haitians, intravenous drug users, hemophiliacs and heterosexuals. Fear and confusion reigned as the disease eventually known as HIV/AIDS grew from a mystery to a pandemic. Kousalya Periaswamy was the first Indian woman to openly admit that she was HIV positive. Over the years, she has helped over 40,000 women across 13 states in the PWN+ network in the country fight the stigma by supporting them financially and legally. Widowed at just 19 and left infected with the HIV virus by her husband, Kousalya was the first Indian woman to declare in full media glare that she was HIV positive. Armed with this idea, Kousalya gathered like-minded women and started a network that would solely work for the positive women, and the name came in instinctively – Positive Women Network. I still remember when I first met her she don’t know english and hind and we communicate with the help of interpreter at Chandigarh in the training workshop she said ‘I think I have just started with my responsibilities and I have to do a lot, my efforts are never ending and I have a long life to go. My hearty congratulations to Kousalya for this honour which she richly deserves.She has come a long way and has been a fighter all along.